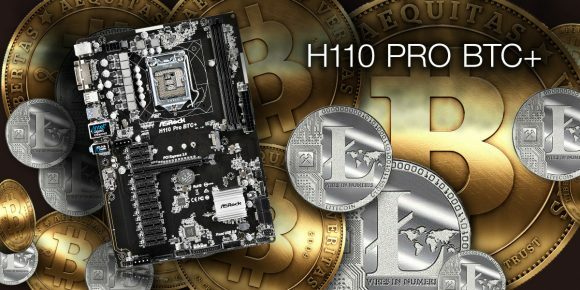 If you thought AsRock is getting behind in the game lately as far as GPU crypto mining motherboards go, well thing again… even though they haven’t had a new Pro BTC motherboard since the H81 Pro BTC they are not sleeping apparently and the recent shortages of that particular and popular model. At Computex 2017 the company has showcased an upcoming product that has caught the attention of the mining community, a motherboard with 13 PCI-Express slots for up to 13 video cards, connected via PCI-E extenders of course as the slots are pretty tightly fitted on the motherboard to retain a standard size. The new motherboard is called Asrock H110 Pro BTC+ and is soon-to-be-launched (no exact launch date given yet)… it even has an M.2 slot onboard, though 14th card via M.2 to PCIe might be a bit too much to expect to work, but who knows. Other than the new chipset and the staggering 13 PCIe slots, the new motherboard seems to follow the design of the previous generation of Pro BTC boards, simplistic and cost effective. Of course the H110 chipset means that you would need to go to the newer Socket 1151 CPUs such as the Intel G3900 series of processors as well as the newer DDR4 memory. We’ll probably have to wait a bit more for additional details such as the full specifications, pricing as well as release date and availability. You can expect the demand to be pretty high though, even considering that the demonstrated solution during Computex in Taipei, Taiwan apparently used Windows and had only 8 GPUs running (based on the available information), but all 13 should be available for use when the new motherboard hits the market hopefully soon (not yet sure if they will work under Windows though). Now all we need are actual gpus to put in! Zulekha Cara, not all motherboards that have 6 or more PCI-E slots are designed to handle 6 or more GPUs, check if the BIOS has a TOLUD option available, it might help. I don’t want to use 2 power supplies again but it looks to be in my future. 1151 CPU sockets are weird for mining. In bios look for “Above 4G Decoding”, or “Cryptocurrency mode…” under PCIE subsystem, and enable it (windows installer or automatic repair hang with it on, so disable for install). This should get you 5. Also look for Max TOLUD, which only some boards have, which gets you 6 AMD cards. Nvidia cards easier to get more going, but not as good price/profit of course. Boards like MSI z270 will only do 5 AMD cards, but Biostar TB250 will do 6 with Max TOLUD set to 3.5GB. Easiest boards are Biostar TB85, or ASRock H81 BTC pro (both 1150 socket), but only sold by scalpers these days, or super lucky find stock on newegg that sells out in 5 minutes. There is a Biostar TB350 coming out in a week that will do 6 cards…. with Ryzen CPU! Thats some serious business right there! Manufacturers are going crazy as well with the mining. As mentioned before in the other thread, boards like this are pretty lackluster. You can get $25 PCIE port multipliers instead. They don’t work with Nvidia, but with AMD they still work fine, although in Windows getting more then 6 AMD cards working is also a problem (8 seems to be the absolute maximum, which is why you see this board demonstrated with 8). In nix AMD cards work with them past 8, same with this board. Can an Intel Core i7-8700K CPU work with this motherboard?